September 28 Marks the 55th anniversary of the first Berenstain Bears book, The Big Honey Hunt published in 1962. Below is one of the first sketches of the Bears, found in the archives 5 years ago while getting ready for our 50th Anniversary. The Bear family has gone through lots of changes since 1962, but the Berenstain Bears have remained a well-known and treasured staple of children’s literature for over half a century! After an awkward meeting with publishers, financial, and contractual worries, Stan & Jan eventually ended up at Random House. It was there that Ted Geisel (Dr. Seuss) was running a new division for the publisher, “Beginner Books”, modeled after his own easy-to-read children’s books. Ted became Stan & Jan’s editor and with his help they started the tumultuous journey of crafting the first Bears book. After multiple re-writes, story boarding, meetings, and notes, Stan & Jan refined their concept and came up with The Big Honey Hunt. After the success of the Big Honey Hunt, the Berenstains went on to publish 17 more books with Dr. Seuss as their editor, and the series about the Bear Family became known as the “Berenstain Bears”. Stan & Jan later moved on from the “Beginner Book” format of rhyming couplets and one syllable words to the 8″x8″ format which allowed longer stories with more complicated plots. From there the Success of the series boomed and there have been over 350 Berenstain Bears stories published since, not including TV Specials, TV series, games, toys, and more! 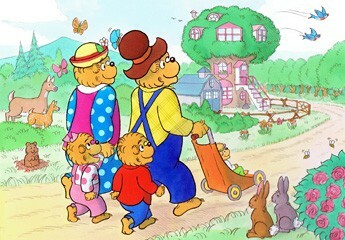 Following the death of Stan Berenstain in 2005, their younger son, Mike took a more active role from illustrating to writing the Bear books along with his mother, Jan. After Jan’s death in 2012 Mike has continued to write and illustrate the Bear books, now published through Harper Collins and Zondervan. On our social media sites we have been going through the archives for our “Berenstain Bears 55 Countdown” , posting images from Berenstain books and sketches from each year starting at 1962 and ending at present day. Scroll through below to see selections and notice how the Bears gradually changed in appearance, as they grew from a family of three to five. We thank you so much for your support and appreciation of the Berenstain Bears. We especially love hearing stories of parents passing down their favorite books to their kids, and even grand-kids! There would be no anniversary to celebrate without readers like you, so… Happy Reading! These books were (and still are) an essential part of my childhood. Thank you so much for continuing the tradition and for keeping the history alive. It means a lot to me and others like me.